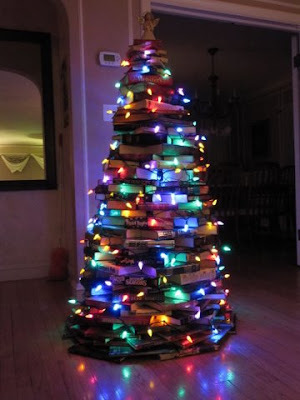 The greenest Christmas tree - a book tree! If you can't decide yet whether to buy a fake or real Christmas tree, because you don't know which option is greener, we have an alternative offer for you - a book tree. Yes, a colorful tree made of books! Sounds impossible? Just look at the photos sent to GalleyCat with great trees people made from books. And of course, it's not just a unique and fun idea, it's also the greenest tree you can have for Christmas! To see more great photos of book trees, visit Galleycat flickr's page.